The Nepal Himalaya has always been known as "The abode of the Gods". Many of the primordial history, religion, culture and tradition as well as legends and myths emanate from the awesome Himalaya. Tibet, the roof of the world, is the perfect destination for the rugged adventurers and the spiritual wanderers. After centuries of complete isolation, Tibet is now opened to the Western World. Bhutan is a land of dramatic contrasts wedged between two giant neighbours, India and China. It is one of the protected land and left blissfully untouched from the rest of the world for a centuries. Darjeeling town known as, Queen of Hills, is strung out over a ridge, just a valley away from Sikkim. 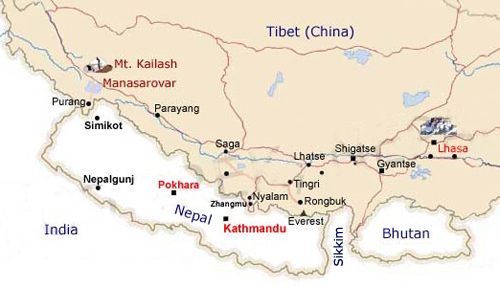 Sikkim is a tiny and once a remote independent Buddhist Kingdom nestled between Nepal, Bhutan & Tibet.